One of the best graphic adventures of recent years, with an interestingly complex main character and some enjoyable puzzles. While it still carries some common adventure game problems, Kathy Rain acts as a nice update to the genre that still looks like a product of the '90s. Adventure game veterans and newcomers should find a lot to love with this one. No hyperbole, Kathy Rain is yet another milestone in this resurgence of old-school point-and-click adventures. It’s a fantastic thriller, a remarkably deep and adult story about grief, transition, religion, and the personal decisions that make or break us, while being an engrossing adventure game for veterans and newcomers alike. A very good classic graphic adventure with smart puzzles and a bizarre atmosphere that goes from Nancy Drew to Twin Peaks. I had a splendid time with Kathy Rain, and thoroughly enjoyed a game where I couldn’t see where it might be heading. For all the problems I've outlined, I haven't enjoyed an AGS adventure this much in quite some time. The end might not satisfy, but the journey is a hell of a ride. 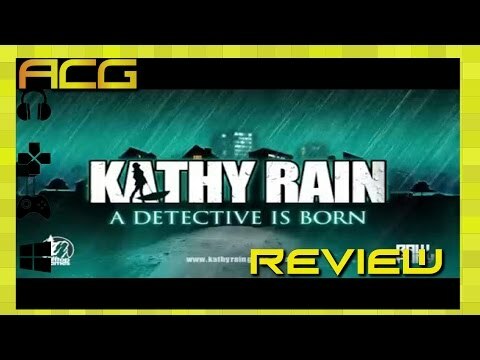 Kathy Rain is an great adventure, that combines a vintage look to an intense and strong story. Given the quality of the plot and the variety of puzzles, we can forgive the presence of some streotypical characers. I will admit that it took me some time to really get into Kathy’s story, but once I reached past the initial pieces, I was soon hooked. As the plot deepened, I found myself captivated and driven to finish the game and see what lay ahead. A fairly brief game that's worth the time to play, but only if you can find answers for when you get stuck. Despite the complete curveball the plot gradually throws at you as it moves along, Kathy Rain is a great adventure game with a story that easily gets you hooked and a mystery filled with a grade-A level of challenge to tackle. Kathy Rain is a delightful little adventure game to add to the massive pile of fun adventure games released in the last couple of months. The puzzles are believable and interesting with some really clever computer hacking ones in there. The story is compelling and entertaining, and the characters are mostly wonderful – in particular the lead girls, Kathy and Eileen (I love you Eileen!). A fantastic story well told, superbly presented. When it comes to point and click adventures on Steam, Kathy reigns. By all means, if you are ever in the mood for a gripping tale and yearn for the days of the classic point-and-click genre then I highly recommend giving Kathy Rain a playthrough. It’s not every day that a video game surprises me, and that is exactly what’s happened here. 'Kathy Rain' is engrossing for nearly all of its admittedly modest running time, even when it takes quirky trips into left field. It may wear its inspirations on its sleeve, but that makes it no less likeable or entertaining. I loved what I saw of Kathy Rain at PAX East, and the finished product was more amazing than I thought possible. This is one of the best point-and-click adventures of the year, and Raw Fury should be immensely proud of their ability to bottle that retro lightning twice. Channeling in themes from Twin Peaks, Kathy Rain has its own story to confuse you with. All in all, Kathy Rain is a top notch game for Nancy Drew fans, mystery lovers or anyone who just loves sassy women on motorcycles.